The letters form in front of you, shimmering into existence from the swirling galaxy of stars that has bloomed out of the floor before you. The people and sights around you melt away as your CORETECHS accepts and projects the simulated reality. Your field of view begins to move, smoothly flowing between the stars that now glimmer in the air in front of you as the phrase drifts away and you seem to journey from system to system, distant sun to distant sun. A soft and soothing voice narrates your journey in dulcet tones. Humanity is on a journey, it always has been, but now, the path meanders between the very stars in the heavens. The heavens are the only home we have left. Benevolent Dynamics is here to guide you, to help you survive the journey and reclaim our former glory. Benevolent Dynamics is an independent technocracy. 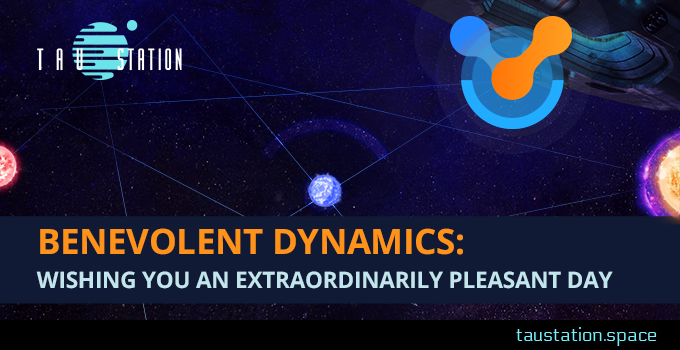 Dedicated to bettering the experience of mankind as we struggle to climb back out of the ash heap of The Catastrophe, we here at Benevolent Dynamics have made it our purpose to reclaim the science and technology of Before. We brought you the CORETECHS, we discovered how to re-activate robots and androids and, with some help from friends in the field, we are even rediscovering the use of the Omni-Reality Engine that is bringing you this very message! Our services are offered freely and for the betterment of mankind alone. Neither the Consortium, the Gaule Protectorate, or even the Freebooters receive any preferential treatment. Rather, Benevolent Dynamics’ sole focus is science, and its reclamation thereof. The field of view tightens, the galaxy swirling around you coalesces into a series of space stations orbiting small planetoids. You can even make out vessels travelling from one to another and through jump-gates to other systems. The beloved brainchild of scientific entrepreneur, Maya Von Christova, Benevolent Dynamics is housed on an autonomous station that enjoys sovereign freedom from matters of politics and current affairs. The location of the station itself is currently classified to maintain this technocratic freedom though you will find many Benevolent Dynamics stalls and representatives around the systems to help with all your technological needs. Every discovery brings new advances that in turn are used to discover the next breakthrough. Nanobyte by nanobyte and light year by light year, we will help guide our species back from the brink of extinction and onwards to whatever the future brings! The stations and star gates fall away, blending into a vast starfield. The stars shimmer and fall like droplets of dew off a water reclamation tank to the floor. Around you, the sights and sounds of the port of Tau Station come back into focus just as a final phrase intones in your mind. Benevolent Dynamics, wishing you an extraordinarily pleasant Day.